The Calumet and Arizona Mining Company developed a new town site in this area in 1905 to ensure the continued success of its mining interests. Using the "City Beautiful" model, the new town site – Warren – provided affordable housing. In 1909 this building was built by Calumet and Arizona Mining Company to house its main offices. In 1931 Phelps Dodge Corporation bought out the Calumet and Arizona Mining Company and this building was used by a variety of businesses. 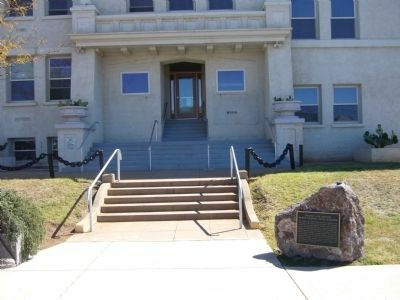 In 1974 the City of Bisbee relocated City Hall here from its prior location in Old Bisbee. 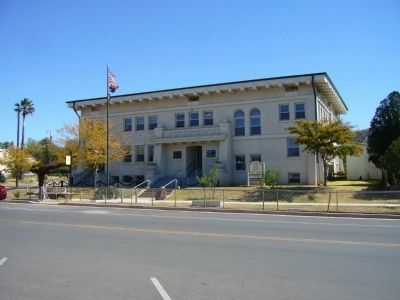 The City of Bisbee purchased the building in 2000, making it the permanent home for City Hall. Location. 31° 24.696′ N, 109° 52.673′ W. Marker is in Bisbee, Arizona, in Cochise County. Marker is on Arizona Street, on the right when traveling north. Touch for map. Marker is at or near this postal address: 118 Arizona Street, Bisbee AZ 85603, United States of America. Touch for directions. away); The Lavender Pit (approx. 2.1 miles away); City of Bisbee Warrior Memorial (approx. 2.9 miles away); Brewery Gulch (approx. 3 miles away); Phelps Dodge General Office Building (approx. 3 miles away); Copper Queen Plaza (approx. 3 miles away); Discovery of Ore (was approx. 3 miles away but has been reported missing. ). Touch for a list and map of all markers in Bisbee. More. 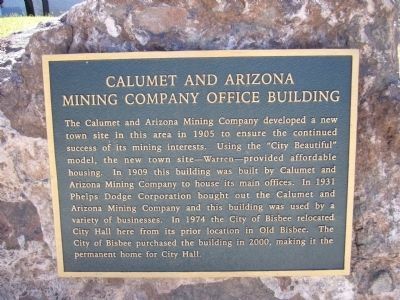 Search the internet for Calumet and Arizona Mining Company Office Building. Credits. This page was last revised on June 16, 2016. This page originally submitted on October 20, 2011, by Bill Kirchner of Tucson, Arizona. This page has been viewed 715 times since then and 3 times this year. Photos: 1, 2, 3. submitted on October 20, 2011, by Bill Kirchner of Tucson, Arizona. • Syd Whittle was the editor who published this page.